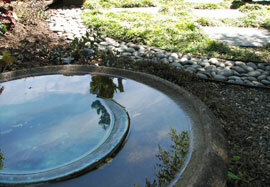 There are many ways for you to conserve water in your landscape. See our tips and resources to help you save money on your water bill, or learn how graywater can help you conserve water indoors and in your yard at the same time! It rains so much here – why do we need to conserve water? Reducing your water use can help you reduce your water and sewer bills significantly! This includes both water use in the home and in your yard. Many outdoor water conservation methods can divert rainfall that would become stormwater runoff (Rain water that runs off the surface of an area, instead of being soaked into the ground.) and allow it to soak into your yard instead. These methods have many benefits: they recharge our local streams and aquifers, reduce the load on our sewer systems, lower erosion and pollution, and provide a simple source of irrigation! 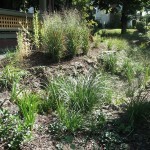 Learn more in the Rain Gardens section. Finally, we have one of the best water systems in the world! A century ago, some thoughtful individuals had the foresight to set aside and protect an entire watershed (A watershed is the area of land where all of the water that is under it or drains off of it goes into the same place) so that our water source would remain pure over time. The more we conserve water, the less demand we put on this system, and we will have less need to seek other water sources. 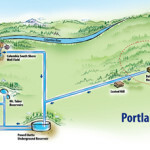 An illustration of our water system, courtesy of the Portland Water Bureau. On the far right is Bull Run Lake, and at the top middle is the Columbia South Shore Well Field. Our primary source is the Bull Run watershed, a 102 square mile area that collects water from rain and snowmelt. It then flows to the Bull Run River, where it is stored in reservoirs that hold 17 billion gallons and provide water to more than 900,000 people! Water from the Bull Run Watershed is delivered by gravity (no pumps needed) and is not filtered! It requires minimal treatment, including chlorinamination (chloramination is the process by which chlorine and a small amount of ammonia are added to a water source to create a long-lasting disinfectant. This is especially useful in larger water distribution systems) to disinfect the water, and a small amount of sodium hydroxide to reduce acidity. Reducing the acidity helps prevent corrosion in plumbing systems. We also have a secondary source of water, the Columbia South Shore Well Field, which draws groundwater from several adjacent aquifers. It is used both during emergencies and to augment the Bull Run supply in the summer. The Portland Water Bureau states that 60% of our household water use is applied to our landscapes. If you consider that the average household uses almost 45,000 gallons per year, that is almost 27,000 gallons being used for landscape irrigation – for just one household! When we are using more water than can be safely drawn from the Bull Run Watershed, we revert to using groundwater from the Columbia South Shore Well Field. This water requires pumping, as well as additional piping and infrastructure. This water source is typically used every summer, when outdoor irrigation and watering are at peak levels. What can we do about our water use? One easy step we can take is to make better use of a plentiful local resource: rain! 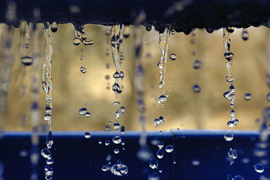 Many of us send rain water off our property as fast as possible through gutters and pipes. This wastes a valuable resource while contributing greatly to the volume of pollution-carrying stormwater runoff. Instead, we can utilize this rainwater to irrigate our landscape, and collect it in rain gardens. By also planting plants that have adapted to our climate and need less watering, we can reduce our water use considerably. We offer free workshops and short presentations on ways you can conserve water and energy by landscaping with native plants, planting a rain garden, and more! You can also check out our Water Conservation Tips, and our Water Conservation Resources page! Many of the facts and information regarding our water sources are courtesy of the Portland Water Bureau. Be sure to check out their website for more programs and information on water conservation, including great tips on how to save water in the home. Read our water conservation tips!